DMS Nuclear designs and delivers powerful specialised technologies, components and systems for the nuclear industry. Our technical expertise and niche design and manufacturing capabilities have helped deliver solutions that are being used at every stage of the sector's decommissioning, reprocessing, nuclear waste management and manufacturing processes. DMS is trusted by some of the world's most prominent nuclear organisations. For example, DMS Nuclear has created a series of cost-effective, highly efficient storage systems and techniques that meet the needs of organisations who deal with low-level radioactive nuclear waste. 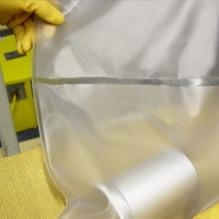 When waste is dispensed into PVC storage bags, our specialist welding equipment and processes ensure the bags can be RF welded to produce a watertight, airtight and permanent seal to meet the stringent storage and security criteria of the world's most demanding repositories. This raft of niche nuclear waste storage solutions has been developed over many years and, today, we are tasked with designing engineered welding systems and industrial processes that complement and support the operations of a sector in which we have excelled to international acclaim. The nuclear industry represents a challenging and uniquely hazardous environment and one in which security, safety and reliability of product is critical to operational success. DMS Nuclear operates to benchmarked standards of health, safety, quality and environmental performance, and is accredited to ISO9001:2008, ISO14001:2004 and OHSAS18001:2007. Our personnel are all security cleared and ready to move when you are. It follows, then, that we are trusted by some of the world's most prominent nuclear organisations to support lifecycle projects that are based on specialist technical systems and products that are designed to endure.